An education is democratic when those who receive it can deliberate in its planning, governance and delivery. If you’re not deliberating with the education process, then you’re just being indoctrinated. The absence of Latino voices from the education process means that many people are not determining what it means to be an American for themselves. Instead, others are running that process for them. Hispanics represent approximately 17 percent of the U.S. population, according to Census data. In public schools, Hispanics and Latinos account for more than a quarter of all public school students. Yet they are not represented the dialogue. “Latinos are missing from the education conversation, especially on education reform,” says Mary Moran, founder of Our Voice Nuestra Voz (OVNV), an education advocacy and parent organizing start-up in New Orleans that seeks to widen the sphere of influence in education. Moran is correct. Power resides in voice. And Latinos’ voices aren’t resounding in schools and communities. Most school boards limit participation in meetings from non-English speakers because of the limited language skills of the board members and the lack of materials presented in other languages. Language shouldn’t be a barrier for engagement and deliberation. However, there is literally an English only agenda. In addition, schools’ faculty strongly influences what is taught and how to teach it. However, Latinos only represent approximately 7 percent of the profession. Latino students (and by extension their families) have numerical representation but lack seats at the table. Discussions on race and education echo the static English only, black-white discourse that tries its best to include Latinos, American Indians and people of Asian descent as afterthoughts. The crude catchall term “people of color” too often translates to black folk and everybody else. We’ve been kicking out Latino voices on the sly for years. So much of the conversation has swirled around immigration, which doesn’t account for most of the growing Latino population in public schools. The adage, “We didn’t cross the border; the border crossed us” comes to mind. Along with erroneous conversations around immigration comes the “they are a drain of local budgets” gibberish, which delegitimizes Latino voice. Also, English as second language discussions often assume the Spanish language – the second most spoken language in the world – to be a liability. When Latino issues are at the core of the discussion, it’s carries downright ugly tone. Donald Trump’s rise in political popularity was fueled by the quote, “They’re [Mexicans] bringing drugs. They’re bringing crime. They’re rapists.” When Trump kicked journalist Jorge Ramos out of a press conference while saying, “Go back to Univision,” Trump resonated with banal, racist rhetoric many consider blunt and frank. So let’s not blame Trump to excuse our mundane racist behaviors. Latinos can landscape our school grounds but our neighbors are not receiving the respect, education and opportunities that will have them run the school. This is exactly what Moran wants to combat with OVNV. To accomplish this, OVNV trains and builds leaders in schools and communities to comprise the Latino Action Network, which creates campaigns on mostly educational issues, but it also focuses on issues that impact the community including immigration and discrimination. OVNV is running an anti discrimination program that brings awareness to Latino experiences and the discrimination they face around immigration, jobs, housing, driver’s licenses, and health access in New Orleans. The group teaches parents how to advocate for themselves in a democratic space that hasn’t made room for their voices. 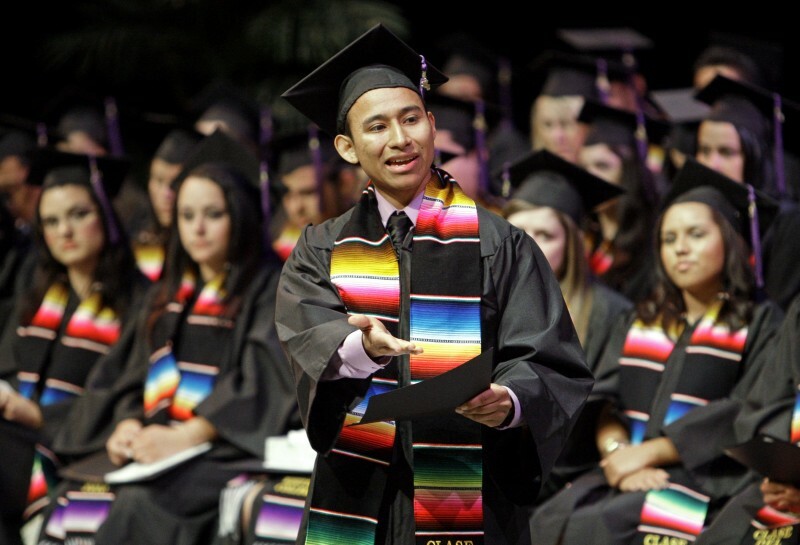 “Graduation rates and college enrollment are improving, but it’s imperative that families have more control of the educations they receive,” said Mark Lopez, senior director for access, diversity and inclusion at the American Dental Association, who researches Latino student success. Lopez says that Latinos have realized growth in spite of policies that don’t touch the unique needs of Latinos in this country. Practicing democracy is an essential element of an education as is learning math, language arts and science and art. It’s a mistake to rigidly act on the idea that schooling is the main problem with education. Schools operate in a larger context that don’t always see students or their families as equal members. Trump should learn that “Mexicans” can and actually do bring democracy and improve our schools in the process. But Latinos can’t wait for others to provide more seats at the table.